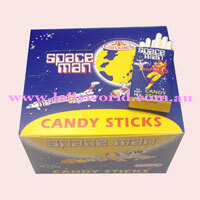 Space Man Candy Sticks are one of those childhood memories of just kicking back with your mates at the park. Playing on what they would now call, very dangerous, swings with no seat belts and the see saw was a plank of wood. Made in New Zealand by Carousel. A 16g packet contains 10 sticks.